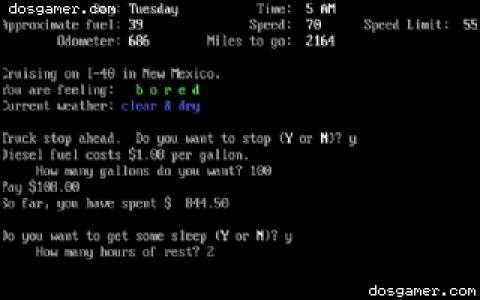 In 87 it was still not the high time for high definition, super realistic trucking simulations, but, even so, even in spite of the limitations of the technology of the period, it was by no means impossible to create a pretty veritable, interesting and challenging 18 wheel rig simulation for those that loved trucking. So, in this game, which, by the way, is turn based, and more akin a turn based board game than a trucking/racing sim, you take turns to transport all sort of freight in and to the cities of the virtual country included in the game. The goods themselves are quite diverse in terms of type and conditions of transportation. The perishable ones are the hardest to see safely to their location, on one hand because they have to be transported in a very short frame of time. On the other hand, non perishable goods are less of a hassle to transport, but then again, they might not earn you as much cash. Many other characteristics are simulated, from the weather, to congestion on the route you are trying to go on, and so on. And, thus flat tires, accidents, roadwork blockages and so on can have you interrupted or have your journey elongated. Graphically, the game is relatively decent, mostly text based, white on black. But, the depth of simulation might entice you. Else, Big Mutha Truckers is the perfect antidote, if the realism and the level of simulation detail in this one isn't to your liking!